A quaint little town comfortably engulfed by the sea on one side and hills on the other. Picturesque views wherever your eyes take you. Away from the hustle bustle of the city, wrapped in its own world, one with whatever is pure and pristine. Solitude, quiet, solemnity are these the words that come to mind when you imagine this place? Think again! This quaint little town is also home to over 10,000 people from all over the world, who are all at the threshold of adulthood. Welcome to Manipal! Manipal is like livewire always buzzing with some sort of activity or the other. With 20 colleges in the same place, this university town is perpetually seething with energy. 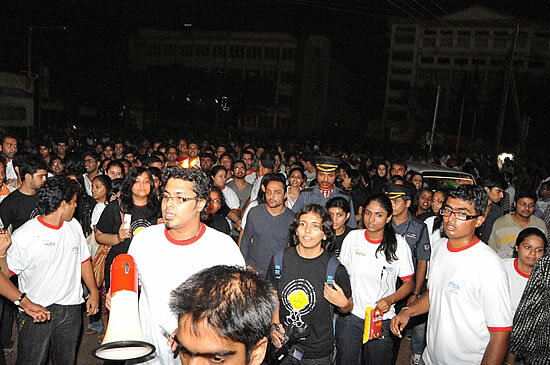 Manipal is typically for the students, by the students and of the students. The town offers anything and everything that a student needs and it caters to the tastes of all kinds of individuals. What does one write about a place like Manipal? One could talk about the geography of the place: its hidden away existence in a tiny part of one amongst many states in a country with close to the largest population in the world. Or its size, with a time radius of about five minutes that envelops this hamlet. Or its habitation, supposedly amongst the most densely populated cellphone zones in the entire country, indicative of over twenty thousand drones nestled away in a variety or hostels, apartment complexes and (for more reasons than immediately obvious) libraries. There is nothing to say that hasn’t been said before. Many before have written great testaments to the “experience” of Manipal. The joy, the unbridled “life” of this University City has been the subject of more than one drunken soliloquy. What can be added then? Perhaps the one universal truth, more incidental than causal, the fact that no matter which way you look at it, and no matter how you resist it, no single person can come here and leave from here the same person. Not many places in India are blessed with what is called a University town, a concept well versed to the public elsewhere. Manipal is like a confluence of cultures, of youth, of ideas and the pros and cons that come with it. A place, that is so imperfect in the eyes of others, it seems perfect to me, a place where you can explore all alleys of life (I seriously mean all!). If you emerge unscathed from Manipal, you have a glorious and awesome future ahead as you have the “Been There, Done That” attitude in life. For the adventure and nature lovers, mountains, trekking trails, wild life sanctuaries, waterfalls all are all just a couple of hours away. For the party animals, there are multiple clubs to choose from where DJs from all over the country keep coming. There are state of the art sporting facilities for the sports fanatics and world class libraries for the studious kind. And for those who are lost and don’t really know what they like and just want to spend their time in an oblivious state of mind, the town yet again gives them the time, space and ambience to do so. Since there are students from all over the world, Manipal gives an almost Utopian atmosphere to those who come to study here. Inter mingling of people from various cultural and ethnic backgrounds gives every student the exposure others crave for. No matter where the person is from, after coming to Manipal no one wants to leave it. This has been the story of the lakhs of students who have passed out of Manipal, which sure does say something about the town. We all know that college life is fun, but college life in Manipal makes it unforgettable. The reasons are abundant, primarily the huge age transition that occurs in the four years (for at least the lucky many that make it out by then). The jump from minor seventeen year olds to drunken twenty one year olds, coupled with the alien amount of freedom, changes everyone.